By far the best preventive skin application comprises of sunscreens, but if the skin has already aged, then the consumer will be confronted with a bewildering array of beauty products claimed to combat skin aging, most unproven. Here is a list of drugs that work. Idebenone is an antioxidant that may be prescribed in 0.5% and 1.0% strengths. 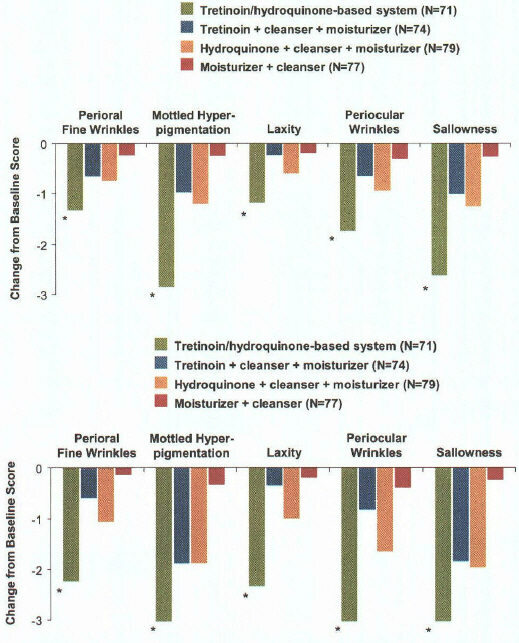 A few weeks of application result in improvement in how rough/dry the skin is, fine lines and wrinkles, and skin hydration (intrinsic moisture in the skin), as shown in Fig. 1. Fig 1. The improvement after 6 weeks of twice-daily application is similar with both strengths, but the shortcoming is that the study did not have controls, i.e., follow-up on participants who received a placebo. McDaniel DH, et al. J Cosmet Dermatol. 2005;4:167-173. The following image shows the results of application of 0.25g of the product, twice daily, around the eyes, for 8 weeks. Fig 2. Copper Zinc Malonate application reduces wrinkles and improves skin elasticity and skin hydration. Mille TF, Batra RS, Ramirez J. Poster presented at: American Academy of Dermatology 65th Annual Meeting; Feb. 2-6, 2007; Washington, DC. 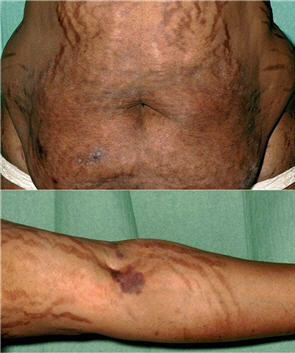 Aged skin has a tendency to become spotty or mottled. Hydroquinones suppress pigment production and can take care of the spots, but they tend to cause skin reddening, scaling, burning and stinging. Vitamin A derivates such as tretinoin and retinol have proven benefits with respect to wrinkles. The following study compared the outcomes resulting from 4 regimens after 12 weeks and 24 weeks. The drugs were 0.1% tretinoin, 4% hydroquinone, cleanser and moisturizer. The applications were twice daily. When tretinoin and hydroquinone were combined, hydroquinone was applied twice daily and tretinoin once daily, and when tretinoin and hydroquinone were used independently, then the application of these drugs was once daily and the second application comprised of cleanser and moisturizer. In the graph below, perioral means around mouth, periocular means around eyes, laxity refers to looseness and sallowness refers to yellowish tone. Fig 3. Improvement of skin variables after 12 weeks and 24 weeks of topical application of various drug combinations. The asterisks imply that the results are significantly different from the other outcomes. Cosmetic Dermatology. 2006;19(4):255-261. Tretinoin may irritate the skin, and hence 0.3% stabilized retinol may be used instead. So these are the proven drugs that help. They can be described as cosmeceuticals since they combine the therapeutic properties of pharmaceuticals and the aesthetic improvement resulting from cosmetics. The article mentions some other potentially promising topical applications based on Vitamin C, Vitamin E and green tea extracts (antioxidants). But the reader is advised to stick to proven therapies. Bruce, S., Cosmeceuticals for the attenuation of extrinsic and intrinsic dermal aging, J Drugs Dermatol, 7, s17 (2008). ummmmm... in lamens terms (http://skinhealthtoday.com/?utm_source=blog)? What types of products have these chemicals/drugs in them? Interesting post, though. Interesting how one product could solve almost any aging problem, from pigment to wrinkles and lines. The bigger cosmetics companies will make you pay a premium to recoup the cost of advertising, and they will pack the topical application with materials that you don’t need to be paying for. The cheap alternatives from Third World nations may not have quality controls and may contain dangerous materials (see the discussion on hydroquinone below). There should be cheap good quality products available at a local pharmacy, but I won’t know what generic/brand names to recommend without doing some research, and this will take some spare time on my part. The patient was diagnosed with Cushing’s syndrome, a disease characterized by excess cortisol production (cortisol is a corticosteroid). But the patient had very low levels of cortisol and a hormone that regulates cortisol production. This is when she admitted to using a skin lightening cream. Druce, M., Goldstone, A. P., Tan, T. M., and Meeran, K., The pursuit of beauty, Lancet, 371, 596 (2008). Using a hydroquinone plus corticosteroid system for a few weeks and for its intended use (to combat age-related spots) is highly unlikely to be harmful, but you get the point. Do some research before buying products to get good quality products for cheap and minimize negative effects. In some cases you can obtain raw products and build your own anti-aging beauty products, as described here for a copper zinc malonate preparation. You mentioned a skin health site. There are many sites like that, and since this is the kind of topic they specialize in, the people behind these sites should be able to help you with brand names. The application of 0.10% pyratine 6 (furfurylaminotetrahydropyranyladenine), twice daily, for 12 weeks resulted in improvement in 1) skin roughness and skin moisturization in 2 weeks, 2) skin spots and fine wrinkles in 4 weeks and reduction in facial erythema (skin reddening) in two weeks. There were minimal side effects. McCullough, J. L., Garcia, R. L., and Reece, B., A clinical study of topical Pyratine 6 for improving the appearance of photodamaged skin, J Drugs Dermatol, 7, 131 (2008). The reason I have used the word promising is that the study did not have controls and two of the authors are consultants with the companies promoting the product. Regarding the reduction in sallowness, is this referring to spots, or a general reduction? Also, is sallowness a charactertic of white skin -- meaning otherwise white-skinned people can develop sallowness -- or does it refer to a general, permanent, light pigmentation? 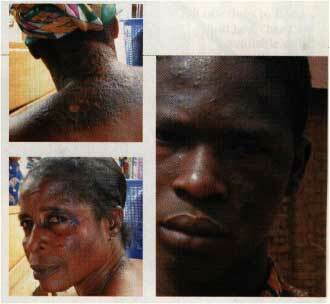 Observer: Sallowness refers to yellow skin tone. Whereas there can be multiple sources of yellow skin tone, the reference here is to the contribution of keratin, a yellow protein in the superficial layer of the skin knows as the epithelium. A thicker epithelium means more of keratin and hence a stronger yellow tone. Since sun-induced aging increases the thickness of the top layer of the skin, it will tend to make the skin look yellower. Normal white skin that has little to no sun exposure does not have a visually discernible yellow tone. If you're looking for an excellent ingredient to aid in the prevention of aging, Spintrap is rad. More effective than L-Ascorbic Acid (stabilized vitamin C). This is another useful combination, and is suitable for dark-skinned populations. It is sold as SolagÃ© (Barrier Therapeutics, Princeton, NJ), and there may be other versions. Read the following. Draelos ZD. The combination of 2% 4-hydroxyanisole (mequinol) and 0.01% tretinoin effectively improves the appearance of solar lentigines in ethnic groups. J Cosmet Dermatol. 2006 Sep;5(3):239-44. Iron chelators may help prevent photoaging? I came across this article, and it is definitely interesting. Iron in the cells is normally largely sequestered by some iron-binding proteins, but exposure to the sun, specifically ultraviolet radiation, releases some of this iron, and then the iron is free to facilitate some cellular reactions that increase oxidative damage (via reactive oxygen species; ROS) and hence contribute to aging. The article mentioned that Kojic acid (5-hydroxy-2-(hydroxymethyl)-4-pyrone), which is widely used for skin whitening in Japan, has an iron-chelating function. Kojic acid has been shown to have anti-wrinkle properties in hairless mice exposed to ultraviolet radiation. Kitazawa M, Iwasaki K, Sakamoto K. Iron chelators may help prevent photoaging. J Cosmet Dermatol. 2006 Sep;5(3):210-7. Micheal Ristow's work suggests ROS production is countered by the mitohormetic effect. Toxic radicals induce an endogenous response culminating in increased defence capacity. Antoxidants are begining to be seen as deleterious to health. Vitamin D by damping down inflamation is the most powerful anti (unnecessary) ROS agent. Copper Zinc malonate sounds promising.